Being Tai Chi, Saturday 3rd December, Birlingham Village Hall. Saturday, 3rd December, Birlingham Village Hall, near Pershore, WR10 3AB, 10.00 - 4.30 pm. This Tai Chi workshop comes as we head into winter proper. It is a timely opportunity to slow down and connect with our inner resources in a gentle, playful and alive way. 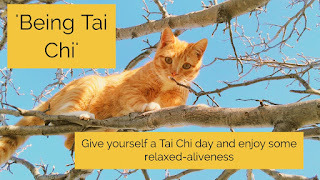 Tai Chi is often called the art of moving meditation and throughout this day we will have opportunities to experience the meditative qualities of Tai Chi alongside the relaxation afforded by inviting the body to move without strain. This day is an opportunity to recognise the speed of everyday life, to soften into the present and to re-connect with the natural qualities of our being which we so often fail to recognise and appreciate. Through movement, guided reflection and relaxation, this day will invite you to trust the gentle heart of your being. 'When we soften what is too tight and fill what is too empty, what is revealed is a dynamic state of relaxed-aliveness. This is the experience of Tai Chi'. The day is suitable for all, whether you have much experience of Tai Chi or none, so please share this with friends and colleagues. Payment for my workshops involves a booking deposit of £25 followed by an additional payment or none at the event. I hope that this enables people to participate in this event and to pay according both to their circumstances and also to their appreciation. I calculate that the comparable value for this all-day workshop to be £55 and ask you for a £25 booking deposit. Prior booking is required and needs to be made before Monday, 21st November. Alan Smith, 111 Victoria Avenue, Worcester WR5 1EE. Payment by BACS is also possible - just contact me for details. Tea and refreshments will be provided throughout the day. Please bring a simple contribution towards a vegetarian lunch. It's possible to arrange lift sharing. Please let me know if you need or can offer a lift. A big thank you from Heartland Tai Chi to all of you who braved the chilly weather and came to Gheluvelt Park today for an hour of playful Tai Chi. There were around 20 of us, including a dog and a toddler, both of whom contributed to a relaxed atmosphere! Hope to see you again soon. Alan demonstrating the art of safe squatting during the Five Elements Chi Kung exercise. Hi everyone, well, yesterday was a washout and then a beautifully sunny day! In view of the early downpour yesterday, we decided to postpone our free Tai Chi in the Park event until Sunday 23rd, 10.30-11.30. As before, just turn up by the tennis courts in Gheluvelt Park and we'll be there for an hour of meditative movement. Hope to see you there! Tai Chi is designed to be practised in the open air and this is an opportunity to gather together with Alan and other Heartland Tai Chi students to play some Tai Chi together in Gheluvelt Park, Barbourne, Worcester. This free event is open both to beginners and experienced Tai Chi players so please do spread the word. We'll meet in the park near to the tennis courts. Hopefully it will be a lovely autumnal morning but please do dress for the weather! I hope you'll be able to come along.